M. K. Theodoratus, Troublesome Neighbors. Bookbaby, 2012. Pp. 55. ISBN 978-1-6248809-3-3. $0.99. Troublesome Neighbors by M.K. Theodoratus, part of the epic fantasy Far Isle Half-Elven series, is a self-published novella that manages to skirt the fringe of a YA style, giving the book a unique if simplistic feel. It tells the story of a veteran heroine now living as a modest and diffident pig-farmer, but unable to entirely leave her military days behind her. Although a pacy and engaging story, it reads more like an unfinished novel, and it begs the question of why this novella wasn’t allowed to flourish as a full-length book. This novella is about a woman, Renna, who once fought as a powerful sorceress in a Half-Elven rebellion. 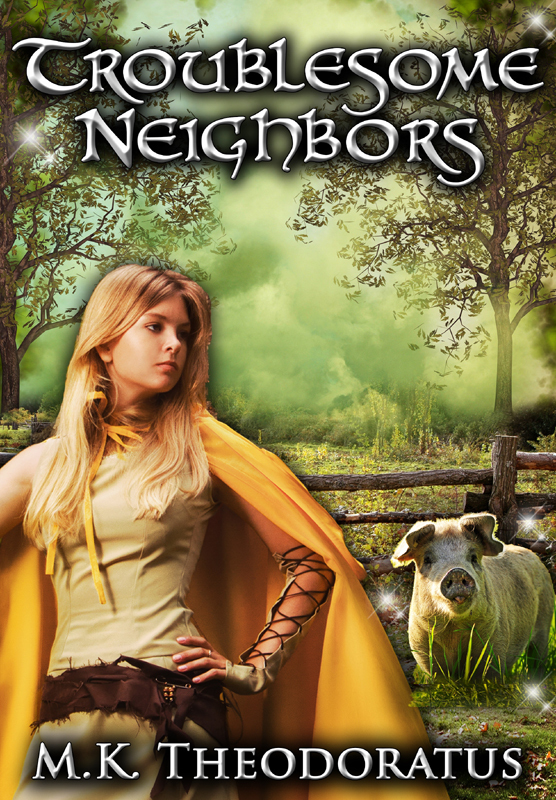 The book starts off simple, with Renna living as a pig herder with no confidence and even less purpose in her life. Everything begins to change when she is approached by one of the more powerful Lords of the land with a marriage proposal, which she immediately rejects. From there, the story of her dodging the Lord’s hand in marriage unfolds, and the Lords unpleasant plans for the land are slowly revealed. This is an extremely fast and easy read, making it suitable for even younger audiences. However, this strength is also its weakness, as I felt there was a lack of depth to the characters as a result of the simplistic writing style. A lot of the characters were left to stereotypes to lift them up, and the ones that weren’t ended up fitting almost too conveniently into trope types. While the motives and personality of the heroine are easily understood, she is portrayed as not being a hero type, but falls too easily into the role of being a heroine. Every moment where she needed backbone, she had it at just the right moments, and then fell back on her old, reclusive and naïve ways. The lack of true development as Renna moves through the motions of the zero to heroine trope was a weakness in this novella, especially as she’s endured the truth of rebellion and war in the past. 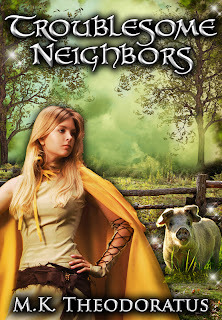 Troublesome Neighbors takes on the scope of traditional and epic fantasy, complete with an intricate weaving of politics and the threat of war on the horizon by the end of it. The scope moves beyond the little pig farm area it starts with, and spreads out to deal with a Lord’s desire for power and conquest. However, it doesn’t have the depth of conflict of the average adult fantasy novel, and it doesn’t have the quick, tight pacing of a YA, putting this novella hanging somewhere between the two. This is actually forgivable, as the writing style does allow for quick, if a bit slower-paced reading compared to YA. It is a faster read compared to the average traditional or epic fantasy novel. That said, the thing that bothered me the most about this novella was the ending. While there are some subtle climax elements, the novella is the set up for another book, and it doesn’t stand well on its own. It is meant to have another novella attached to it. The problem with this, for me, lies in the fact that there just wasn’t sufficient resolution in the book, in terms of characters or events, to make it feel like I had read a completed piece. The ending felt very much like the start of the climax of a full-length novel instead of a full story of its own accord. When I reached the end the first thing I thought was, “Where is the rest?” There is the start of a story here, and it could be a very good story, if the author had gone the route of a full-length novel instead of a novella. At this point, however, I felt like I had been given half of a book, where the true ending was still far, far out of sight, and without the satisfaction offered by the first book of a regular series. Still, that said, there are a lot of interesting tidbits to the world that M.K. Theodoratus is creating, and the potential for an epic and sweeping story are in place, especially if she were to decide to pull away from the novella format and let the story take flight by giving it the freedom of a full-length novel piece.